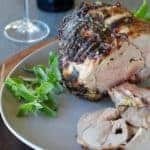 The fresh herbs, lemon and orange give a Mediterranean flavor to Citrus Herb Grilled Leg of Lamb, right in your own backyard! In a blender or food processor, combine mustard, garlic, herbs, lemon, orange, olive oil and pepper. Blend until smooth. Marinade will be thick. Spoon into a large zip-top bag, add lamb. Close the bag and massage the meat to coat it well. Place in the refrigerator to marinate for 4-6 hours, or overnight. When ready to cook, remove lamb from marinade, leave some of the mixture on the meat. Thread on rotisserie skewers making sure the meat is centered. A lopsided roast results in uneven cooking. Place a drip pan under the roast to avoid flare-ups. Turn on the grill and rotisserie following the manufacturer’s instructions. Turn on the motor. Cook at 325°F for 20 to 40 minutes, depending on size of roast and your preferred doneness. To test for doneness, insert an instant-read meat thermometer or remote thermometer into the center of the roast. The internal temperature for medium rare is 145°F and medium is 160°F. Begin checking doneness before the minimum cooking time. Roast increase about 5 to 10 degrees in temperature during the 15-minute resting time after it is removed from heat. Heat drives the juices into the center of the meat, so allow to rest for 15 minutes to redistribute the juices before slicing. On a gas grill, turn all burners to high, close lid and heat until hot, about 15 minutes. Scrape grates to clean. Turn off burners on one side of grill. Turn remaining burners to medium. On the side without heat, grill lamb, fat side down, over medium heat, 25 to 30 minutes, depending on doneness. A drip pan under the meat will help keep the grill clean from dripping fat. Remove lamb from grill and loosely cover with foil, let rest for about 15 minutes before slicing. I cooked this on the rotisserie for a slow cooked, slow basted lamb. You could also grill it or roast it in the oven. Nutrition information is adjusted for marinade use. Marinade provides flavor, but is not all consumed.